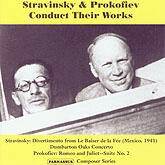 Igor Stravinsky and Sergei Prokofiev both made well-known recordings of their own music. But Parnassus has brought back two rare recordings of Stravinsky’s conducting, and has made Prokofiev’s only recording as a conductor more listenable than it’s ever been before. Even the most knowledgeable collectors of historical recordings may be surprised to learn that Igor Stravinsky made a recording in Mexico. In 1940, Stravinsky travelled to Mexico City at the invitation of Carlos Chávez, the well-known composer and conductor, to lead a program of his own music. A recording session proved unsatisfactory due to background noises, so the following year Stravinsky returned to Mexico City to re-record his Divertimento from “The Fairy’s Kiss,” his ingenious reworking of Tchaikovsky music. This original 78 set is the rarest of all of Stravinsky’s recordings, with only three surviving copies known. In our reissue it proves to have surprisingly fine sound and excellent playing from the Mexico City Symphony Orchestra. Stravinsky’s debut recording of the “Dumbarton Oaks” Concerto was made for the small Keynote company, and was reissued on an early LP by Mercury. It has not been previously available on CD. Prokofiev, although he was a reluctant conductor who learned the art only to perform his own works, eventually became quite an adept leader of orchestras. It’s a pity that we have only one recording of his conducting, but it’s a significant one: the Second Suite from Romeo and Juliet. This recording was reissued several times on LPs, with most of these transfers taken from dubbed 78s which were incomplete. Two previous CD editions were horrors, in dreadfully distorted sound. Mark Obert-Thorn’s restoration, taken from the original Russian 78s, offers the first opportunity in decades to hear this important performance as it was meant to sound.